Today it is the Birthday of my dear friend, Trixi! 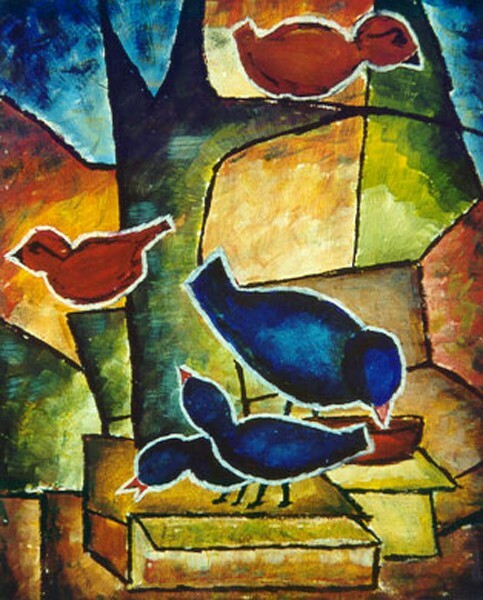 Knowing her great love for birds I thought it would be appropriate to congratulate her with this painting. Dear Trixi, I wish you a wonderful day with family and friends and your sweet Buschi! Artist Reply: Thank you very much for the beautiful comment, Angel! Artist Reply: Thank you very much, Pam! a mervelous realisation,for a great friend.all my compliments for this wonderfull artwork. Artist Reply: Thank you very much, Yves! I Love You colors and Concepts Very Bright! Artist Reply: Dear John, thank you so much for your beautiful comment! Wow! Love the stained glass effect. Thank you also on your comments on (Wise Old Toad), everyone seems to like that one alot. In response to your comment about roses, yes, I agree with you, thet ARE the "queen of flowers", especially the red ones. Artist Reply: Thank you so much for your wonderful comment, Kimberlee. Your work is awesome!